Yesterday, for the first time ever, the Olympic torch was taken into space as two Russian cosmonauts took it on a spacewalk outside of the International Space Station. 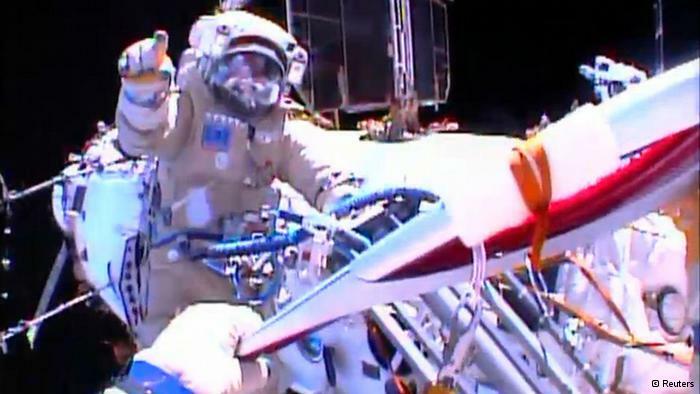 NASA streamed video of the event as two cosmonauts, Oleg Kotov and Sergei Ryazanskiy, conducted their walk while the torch bobbed weightlessly from the end of a tether. The two cosmonauts took several photos with the torch hovering with planet Earth in the background, the orb’s edge capturing the sunrise and emitting a bright glow. After two hours, they returned it to the space station and got to other tasks on their itinerary, which included attaching a footrest and a camera platform to the exterior of the orbiting laboratory. The walk was just latest leg in the torch’s journey, which began on October 7th when the torch was delivered from Greece to Moscow. 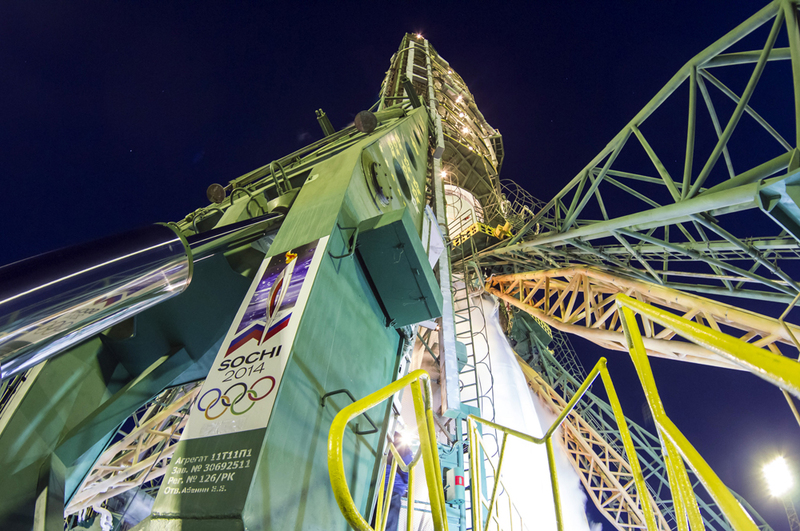 After touring the country, a journey which took it from Moscow, to St. Petersburg, and even to the North Pole (another first) aboard an atomic-powered icebreaker, the torch was launched last Thursday aboard a Soyuz rocket from the Baikonur Cosmodrome. Inspired by the Firebird of Russian folklore, a magical glowing birdt hat can be both a blessing and a curse to its owner, the metre-long torch – which weighs roughly 2 kg (4.4 lbs) on Earth – accompanied a three-man crew into space. 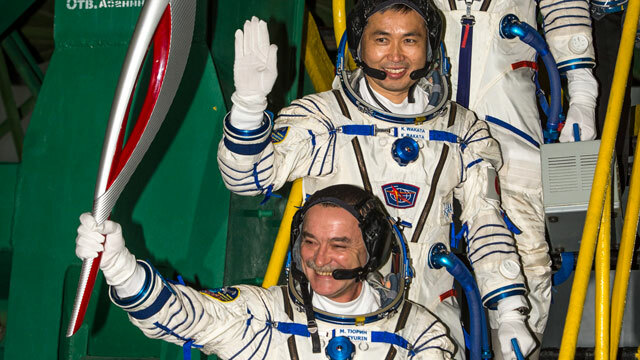 This consisted of a Russian cosmonaut and an American and Japanese astronaut, bringing the total number of crew aboard the station to nine. 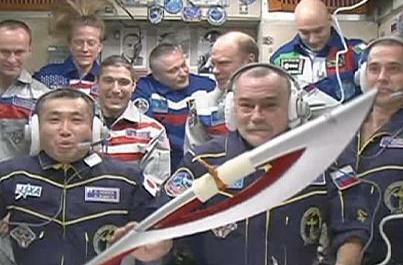 Granted, this is not the first time an Olympic torch has been taken into space. In 1996 and again in 2000, the Atlanta and Sydney Olympic torches were flown into space aboard the U.S. Space Shuttle Atlantis, in preparation for the Atlanta Summer Olympics. However, in that case, the torch was not taken outside of the spacecraft, which makes this a true first. Much like on that occasion, the torch remained unlit while it was in space, as lighting it would have consumed precious oxygen. Still, the ISS crew managed to carry the unlit torch with them on a tour through several of the station’s modules and snapped pictures of it all. This took place over the course of several days before it stepped into space on Saturday. 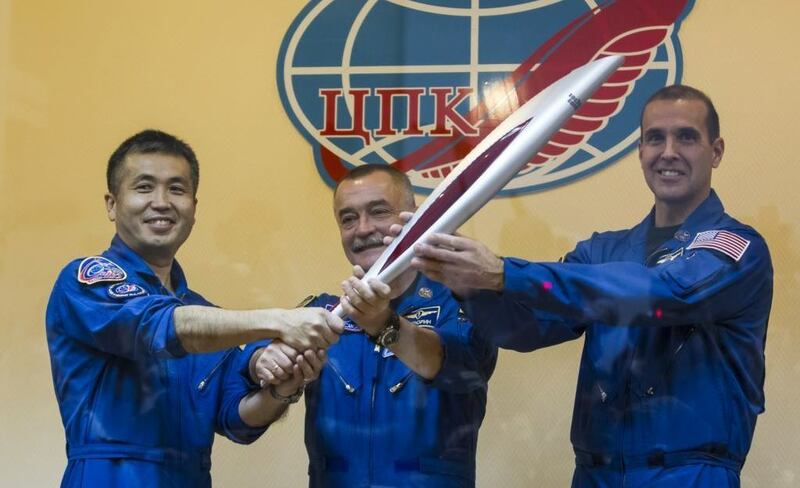 The torch is set to return to Earth tomorrow along with Russian cosmonaut Fyodor Yurchikhin, U.S. astronaut Karen Nyberg and Italian Luca Parmitano of the European Space Agency. Once home, it will be handed off to Sochi 2014 officials and continue on its 65,000 kilometer (44,000 mile) journey, which just happens to be the longest Olympic torch relay in history. The torch is also planned to reach such destinations as Mount Elbrus (Europe’s highest peak) in the Caucasus mountain range before arriving in Sochi on February 7th, where it will kick of the 22nd Winter Games. In another interesting first, this will be the first time that an Olympic Games has been held by the Russian Federation, whereas the 1980 Summer Olympics that were held in Moscow took place during the era of the Soviet Union. 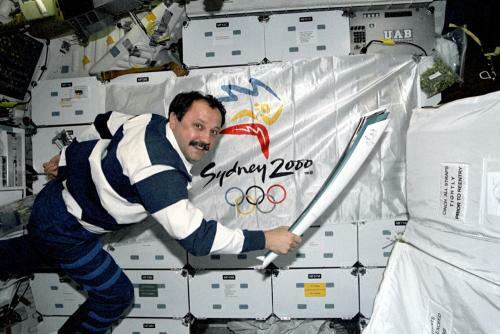 According to Deputy Prime Minister Dmitry Kozak, who has been in charge of planning the Olympics, transporting the Olympic torch to the ISS and bringing it into space is seen as “[A] way to show the world what Russia is made of.” He said it would display Russia’s “might” and its economic achievements, not unlike China did with the Tiangong space station. Though the upcoming games are still a source of controversy to many – due to the recent passage of several laws that criminalize what officials call “gay propaganda” – this latest part of the Sochi Olympic torch relay showcases what is truly great about the Olympics. Not only was it an historic first, it also reminds us what the Olympics are all about. Originally conceived as a way of fostering goodwill between Greece’s city-states, and resurrected in 1894 to foster goodwill between nation-states, bringing the torch on board the ISS amidst a crew of international scientists helps to celebrate the spirit of diversity and tolerance which can and must define our modern world. Papa Zulu – Second Revision 1/2 Done! Hey Matt, I’m thinking of holding the Olympic torch hostage until Russia changes its laws or the Olympics are moved to an LGBT-friendly country or world leaders admit that the Olympics don’t actually contribute to world peace but to sponsors’ bank accounts, whichever comes first. You in? Hmmm… could we throw in an option of holding the Olympics in Vancouver too? Either Russia reforms, or the IOC relocates the games, or they never see it again. Think they might go for that? The places that torch has been! I have been following this in the news too, Matt. Awesome! It is, isn’t it? It’s especially exciting to me since it’s a space first. I can imagine it now, how an Olympic torch relay might actually involve trips around the Solar System in the not-too-distant future. Picture it: the torch being flown from Earth to Mars and carried up Olympus Mons before lighting the fire in the capitol of Ares City, kicking off the 2080 Games! Ahh, yes. I hope they invent faster ships, though. Oh, there’s all kinds of possibilities. What’s your pleasure? Fusion-powered? Antimatter? Solar Sail? Nuclear bombs detonated out the back end to push it forward? They’ll are being considered. Whatever doesn’t kill you, I guess.